Soilworks, the worldwide leader in dust control and soil stabilization, is helping keep BMX tracks running smoothly this race season with its flagship soil stabilization product, Soiltac. Race tracks tend to soften when exposed to rain and become susceptible to ruts, which can be dangerous for riders racing at fast speeds. Our copolymer dust control and soil stabilization product, Soiltac, is water-resistant and creates a durable surface. 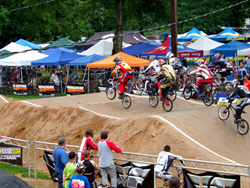 Spring signals the beginning of race season for many tracks across the globe and BMX track builders like the Olympics and World Cup trust Soiltac to create sturdy race tracks that can withstand high impact and inclement weather. The most durable of Soilworks’ product lines, Soiltac is a revolutionary copolymer product that serves to control dust, erosion and stabilize soil on a range of surfaces. When applied to a surface, Soiltac’s copolymer molecules work to form bonds between the soil or aggregate particles, creating a flexible solid-mass that is extremely durable and water-resistant. For more information about Soilworks, please visit http://www.soilworks.com.